Leiji Matsumoto 999 ~Story of Galaxy Express 999 - PlayStation Action Adventure game. Released: 6/28/2001. I actually own this game. If you have a way to play PlayStation console from Japan (unfortunately PlayStation games are region coded), you should get it. The animation (total 20minutes) is superb! 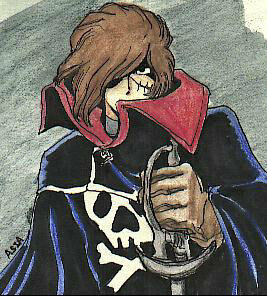 You get to play mainly as Tetsuro, and in some chapters, Emraldas, Harlock and Tochiro.